The variable SLI/CF connection piece connects two VGA water blocks which are installed in a Multi-GPU array. The special feature of this piece is its adjust ability by approx. 12mm lengthwise. 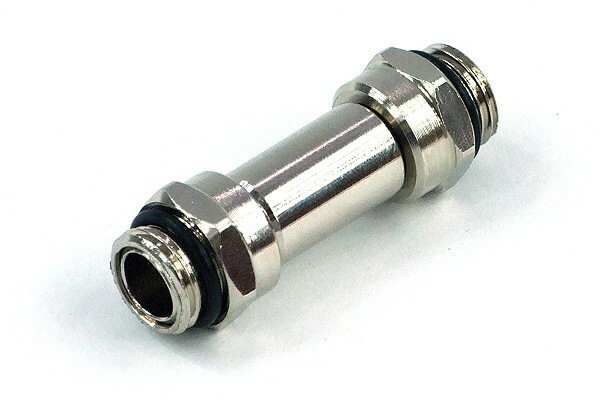 therefore this connector can be used on graphics card and water blocks from multiple manufacturers. The connector piece can be used to parallely or serially connect the water blocks. This is of course also possible with more than 2 waterblocks for e.g. Triple SLI or Quad Crossfire. Please note: The connector piece is only compatible with waterblocks which have connectors on both their top- and underside. It cannot be used on waterblocks with only one set of connectors (e.g. aquacomputer).